A community group where members share their talents and services, record their hours, and then “spend” their credit later on services they want. 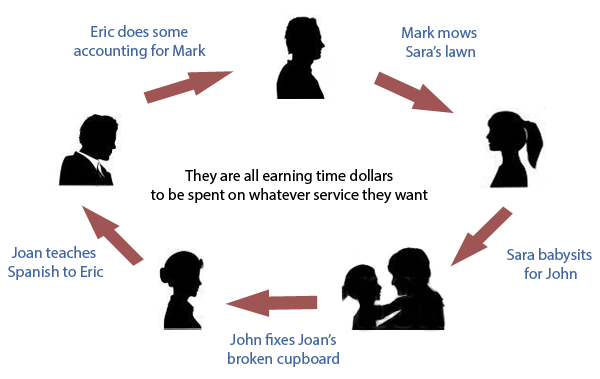 In this network of neighborly service exchanges, time is the currency, and everyone’s hours have equal value. Our members have traded cooking, transportation, logo design, music lessons, overnight stays, home organization, poster making, oven cleaning, gardening, yard work, social media assistance, and more. As we grow, the exchange possibilities will be even more exciting! What can timebanking do for you? "Become a Member" to start your registration. There are timebanks all across our country and around the world! We're so excited to be part of this international movement and to learn from the ways other timebanks work. Here are some great examples and resources for more information on timebanking.